ABA—Soldiers have launched a manhunt for publishers of Biafra newspapers in Aba, Abia state. 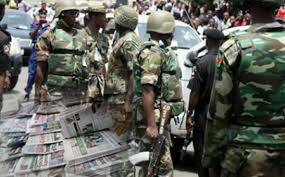 A vendor who spoke on the condition of anonymity told Vanguard that a group of soldiers accosted him and some of his colleagues demanding them to disclose the identity of the publishers of the Biafra newspapers circulating in the city. Vanguard gathered that one of the vendors identified as Emeka is suspected to have been arrested by soldiers. Recall that soldiers attached to the 144 Battalion Asa, Ukwa West Council area, had on March 14, 2016, confiscated unsold and new editions of Biafra newspapers; New Republic, Vesym, Freedom Journal, including copies of Authority newspapers in Aba. Some of the vendors have devised strategies to conceal and sell the pro Biafra newspapers and magazines which are in hot demand in the city. Biafra newspapers sell more than national newspapers in Aba. A publisher, who declined to be named for fear of reprisal, in an interview with Vanguard, condemned the action of the military, and denied that Biafra newspapers incite hatred among the people, stressing that they only publish Biafra stories as some national dailies do. “We are publishing only reports about Biafra like other national dailies do. Let the military go and close down all the media houses because they are carrying Biafra stories, after all, we are not the only people publishing stories on Biafra.” As at the time of filing this report, efforts to get the reaction of the Army Public Relations Officer, 14 Brigade Ohafia, Major Sidney Mbaneme, proved abortive as his mobile number was unavailable.